Johnny Depp has a new movie in theaters. For some, that will simply be occasion to see and evaluate a new film starring the popular entertainer and Oscar nominee Johnny Depp. For others, however, Transcendence will provide another opportunity, after last year’s The Lone Ranger, to ask what the hell happened to disgraced former icon and current hack Johnny Depp—or, more specifically, to complain about the actor destroying all his cred and goodwill, or to posit that if time travel existed, the technology could allow an attractive, successful guy to actively resent himself. No, really, it’s that simple. In terms of productivity, quality, and ability, Depp did not undergo a dramatic transformation sometime after the first Pirates Of The Caribbean movie came out in 2003. This is a statistical fact, by which I mean it’s time for some rudimentary counting. For easy comparison, let’s designate 1990-2002 as Depp’s pre-Pirates period, starting with 1990’s Cry-Baby, discounting some bit parts and 21 Jump Street. During this period, Depp acted in 20 movies. The batch includes three with Tim Burton; a movie apiece with auteurs Terry Gilliam, Jim Jarmusch, and John Waters; three crime thrillers of decent-to-high quality (Donnie Brasco; From Hell; Blow); three movies where he plays a gentle oddball (Benny And Joon; What’s Eating Gilbert Grape; Don Juan DeMarco); two supporting roles in prestige pictures (Chocolat; Before Night Falls); three low-rent thrillers that not a lot of people saw or liked (Nick Of Time; The Astronaut’s Wife; and, yes, even though it was directed by Roman Polanski, The Ninth Gate); and three obscurities and/or pet projects (Arizona Dream; The Man Who Cried; and his barely released directorial debut, The Brave). From Pirates onward, Depp did another 20 movies (not counting cameos but including lead-role work in animated movies Rango and Corpse Bride). This run includes five with Tim Burton; five with Gore Verbinski, plus an extra Pirates picture without him; a movie apiece with auteurs Terry Gilliam, Michael Mann, and Robert Rodriguez; one movie where he plays a gentle oddball (Finding Neverland); a couple of less low-rent but still not very successful thrillers (Secret Window; The Tourist); and a couple of less-obscure pet projects (The Rum Diary; The Libertine). Transcendence is something of a hybrid, aspiring to and mostly failing at think-heavy sci-fi with a dash of bittersweet romance. Comparing the pre-Pirates list to the post-Pirates list basically indicates that the notable shift in Depp’s output has been to do more movies with Burton and Verbinksi (who are, at very least, talented and visually distinctive directors—and at best, collaborators on some of Depp’s best work) and book slightly fewer obscurities, supporting roles, and crap thrillers. Also, he doesn’t direct anymore, which seems like a good thing for all involved. It’s a small adjustment, not a seismic shift; contrary to conventional wisdom, it hasn’t really affected his batting average that much. 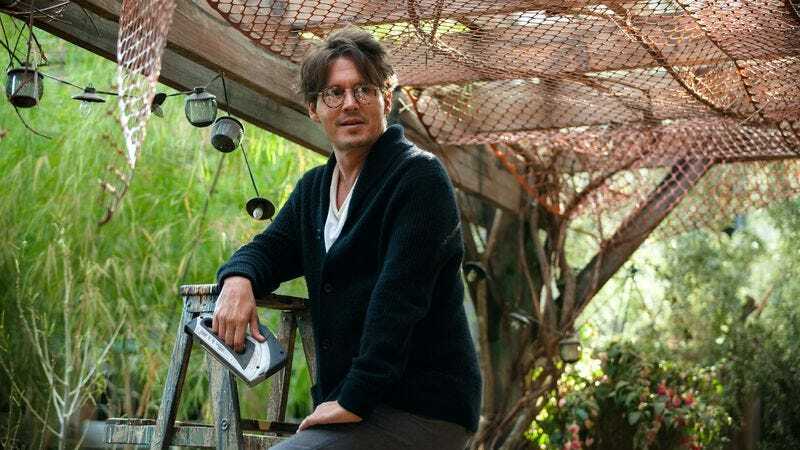 Quibble over the superiority of Waters to Rodriguez, or of What’s Eating Gilbert Grape to Finding Neverland, but the overall eclecticism of Depp’s path remains intact. On either side of Pirates, he doesn’t have a professional directive as clear as, say, Leonardo DiCaprio (work with great filmmakers and/or singular voices whenever possible) or Will Smith (please as many people as possible, as often as possible). To the extent that a career as varied as Depp’s can be said to have a pattern, that pattern, full of weird detours but also plenty of recurring themes and triumphs, has not changed. Fake statistics and personal opinions about the quantity and quality of Depp’s work will probably not convince his detractors, though it would ideally deflate some of the hyperbole that surrounds his second act. To some degree, the combination of confusion and memory loss that animates many anti-Depp screeds is understandable (though the anger remains a bit much), in the sense that Depp’s least interesting movies from that first period had the luxury of quiet, sometimes barely detectable failure. If Depp did a movie as schlocky as Nick Of Time today, people would ask what the hell he’s thinking; if he poured his soul into directing a movie like The Brave post-Pirates, it probably would have been released more widely, and roundly lambasted as a crazy folly. In the ’90s, those movies garnered mostly shrugs, if that. But Depp’s decade-plus of zigzagging through failures and successes did turn out to be, in retrospect and quite possibly unintentionally, a canny career move. He stayed just popular enough to build broad awareness of his talent without crossing over into real mainstream success or astronomical expectations. So when he did make that movie-star transition with the first Pirates Of The Caribbean, he consolidated many casual fans while adding plenty of new ones. Before 2003, Depp was appreciated and even beloved by some. But Pirates, with its huge box office and accompanying Oscar nomination, allowed his following to coalesce. It’s the movie-star equivalent of a workhorse major-label band finally going multi-platinum on their seventh or eighth album. But while music critics or fans might reserve some disdain for latecomer admirers, either directly or by implication when disparaging more accessible records, in this case it’s Depp himself who is accused of slinging shtick—of pandering to an audience that’s sick of him. Of course, shtick is a fair description of Jack Sparrow. But that designation of Depp in general has less to do with his actual performance style (which can range from grounded and quiet to committed eccentricity) than with how widely almost all of his performances are now seen. He still works like an offbeat character actor, following a shambling muse, but does so under a megawatt spotlight. But that’s the (admittedly cushy) problem with becoming a movie star: You get assigned a thing that you always do, and descriptions of your career often warp to accommodate that assignment. Witness even an elusive weirdo like Nicolas Cage; Community didn’t quite nail Cage’s work during its episode meant to playfully address the complexity of whether the actor is “good or bad.” (Depp, meanwhile, was dismissed in the same episode as “the bad kind of good,” a funny line that lands like a snotty Family Guy-style side-swipe). Given Cage’s winding resume—longer and arguably even stranger than Depp’s—there shouldn’t be much doubt as to whether the star of Adaptation, Matchstick Men, Leaving Las Vegas, Face/Off, The Weather Man, and Bad Lieutenant: Port Of Call New Orleans, among others, might be “bad.” But it’s funnier and easier to talk about some nonexistent paradox than to explore his performances with any depth. (Frankly, Andy Samberg’s SNL caricature of Cage was a more accurate distillation of his eccentricities than Community’s attempts at mock academia). That faux-critical meme has also fallen several laps behind Cage’s actual work, which has included in recent years a run of depressing, generic bill-paying thrillers surprisingly un-enlivened by Cage’s presence, followed by a great turn in David Gordon Green’s Joe (to be followed, apparently, by some more low-rent thrillers). Of course, it’s silly to expect a nuanced consideration of an actor’s body of work from a meme. It is fair, though, to expect more than meme-level analysis of an actor from supposed critical sources. Obviously this doesn’t require abiding appreciation of Depp’s every move, but he probably deserves at least the same leeway afforded to, say, Robert Downey Jr., who has so far—get ready for some more light math—dedicated over half of his post-Iron Man comeback roles to playing either Tony Stark or Sherlock Holmes, to relatively little protestation. Maybe this has to do with the types of characters Downey plays; even pre-megafame, he tended toward prickliness, while Depp won a lot of hearts with Edward Scissorhands and Benny And Joon. Some of those hearts sink, apparently, when he fails to re-woo them years later. Depp’s lack of vanity, his willingness to bury himself in weird makeup or tics (even or especially as he remains a considerable physical specimen in middle age) gets tagged instead as a kind of self-obsession, a reluctance to appear normal. The subtext of many what-happened-to-Depp pieces is: Johnny Depp should be more worried about what we think of him, about whether we see through his efforts to be weird. But the way that people see Depp in the glare of the spotlight says as much about those looking as it does about the actor himself. Somehow Depp’s choices only became “grating” and full of shtick after he took center stage in Hollywood; this is how the wildness of Fear And Loathing (a critically reviled box office flop in its time) remains in his plus column, while a more grounded version of his Hunter S. Thompson in The Rum Diary gets marked down as a minus. Performers like Depp and Cage (and to a lesser extent, Downey), who combine the eccentricity of character actors with the outsize magnetism of traditional stars, don’t always get credit for the weirdness they bring to big studio movies—especially when those movies are commercially successful. Better, it seems, to pine for the days when audiences weren’t bothered by the affectations of Benny And Joon or the chintziness of The Ninth Gate, because they didn’t see them at all. The sentiment is clear, familiar, and vaguely anti-movie: We liked you better when we were only half paying attention.